This guidance covers a number of different marking strategies currently in use in the United States and Canada. 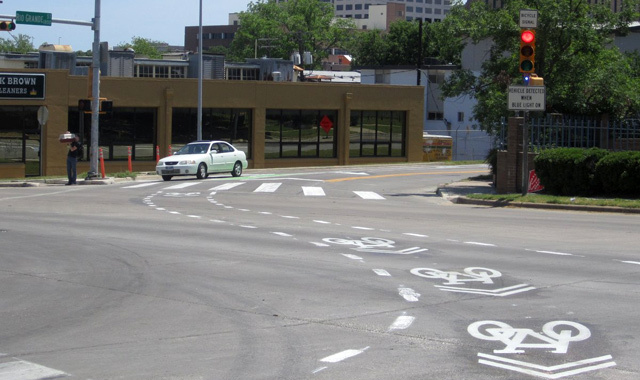 Cities considering implementing markings through intersections should consider standardizing future designs to avoid confusion. Click on the images below to view 3D concepts of intersection crossing markings. The configurations shown are based on Portland, OR, and New York City examples. Treatment details can be accessed below under design guidance. Transportation Association of Canada. (2008). Coloured Bicycle Lanes Simulator Testing. File 785. Hunter, W.W. et al. (2000). 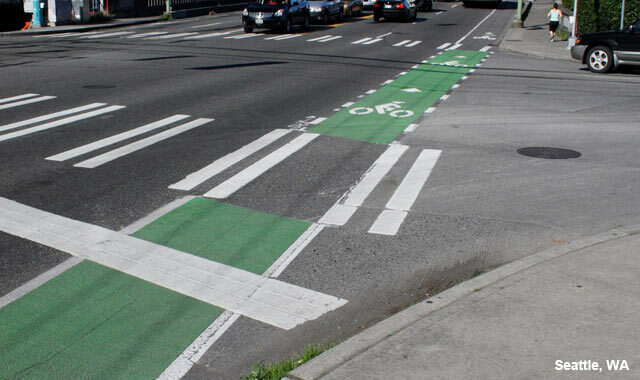 Evaluation of Blue Bike-Lane Treatment in Portland, Oregon. Transportation Research Record, 1705, 107-115. 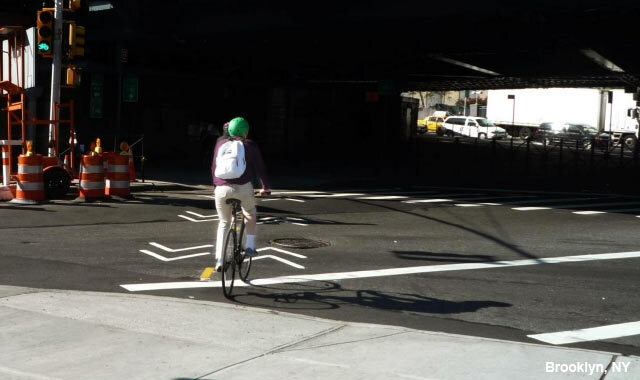 Guides bicyclists through the intersection in a straight and direct path. Makes bicycle movements more predictable. 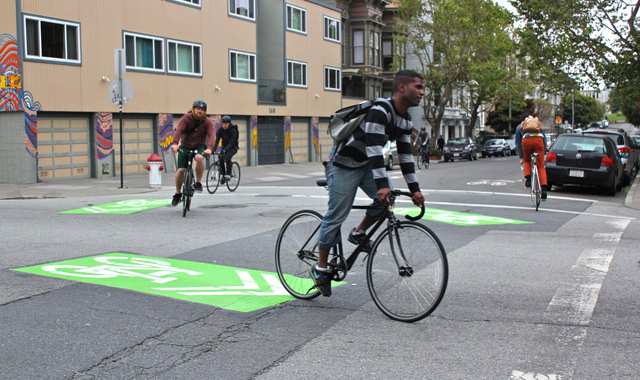 Increases the visibility of bicyclists. Jensen, S. U. (2008). 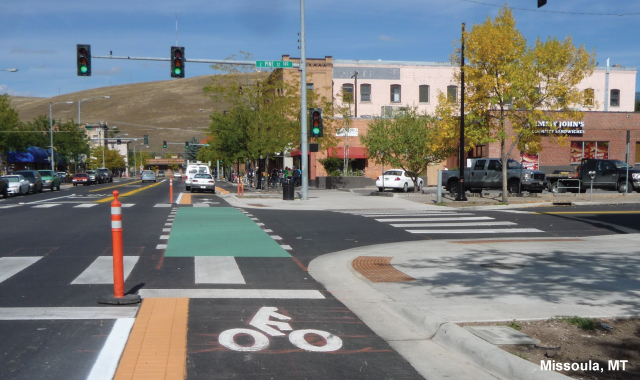 Safety effects of blue cycle crossings: A before-after study. Accident Analysis & Prevention, 40(2), 742-750. 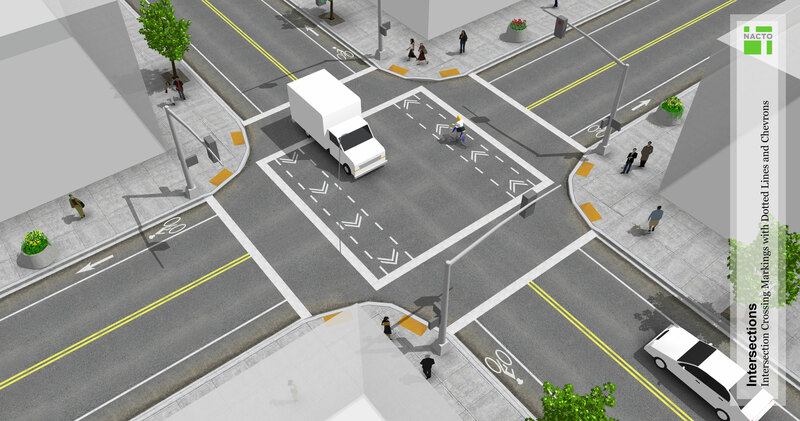 Across signalized intersections, particularly through wide or complex intersections where the bicycle path may be unclear. Along roadways with bike lanes or cycle tracks. Across driveways and Stop or Yield-controlled cross-streets. 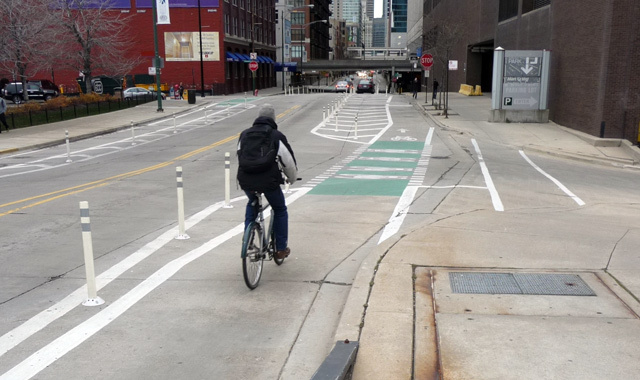 Where typical vehicle movements frequently encroach into bicycle space, such as across ramp-style exits and entries where the prevailing speed of ramp traffic at the conflict point is low enough that motorist yielding behavior can be expected. May not be applicable for crossings in which bicycles are expected to yield priority, such as when the street with the bicycle route has Stop or Yield control at an intersection. 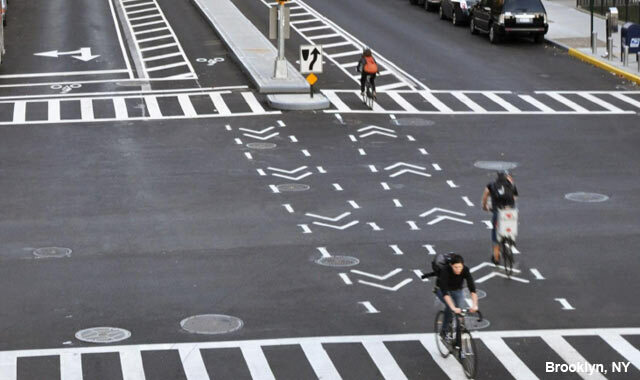 Dotted lines shall bind the bicycle crossing space. 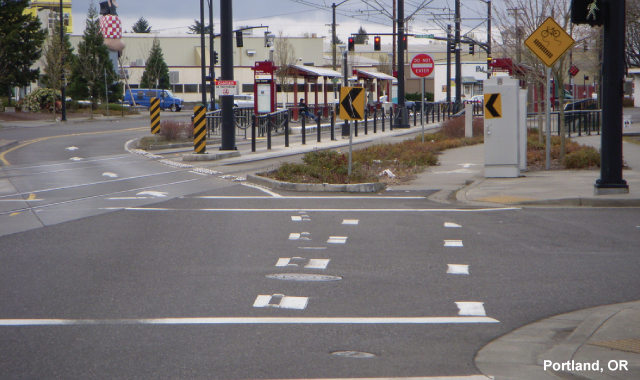 See MUTCD Section 3B.08 for dotted line extensions through intersections. Federal Highway Administration. (2009). Manual on Uniform Traffic Control Devices. Section 3B.08. 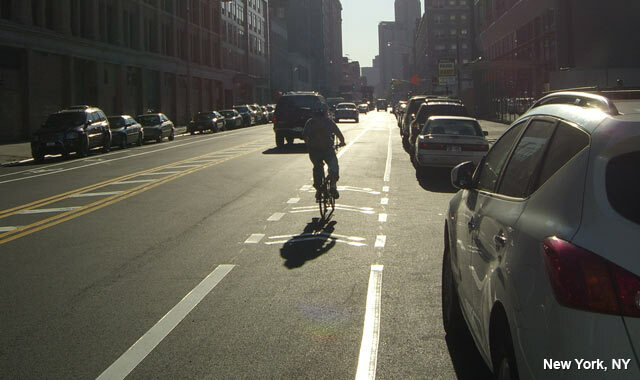 A bike lane should be delineated from the motor vehicle travel lanes with a 150-mm (6-inch) solid white line. Some jurisdictions have used a 200-mm (8-inch) line for added distinction. AASHTO. (1999). Guide for the Development of Bicycle Facilities. Dotted lines should be 2 foot lines with 2 to 6 foot spacing. 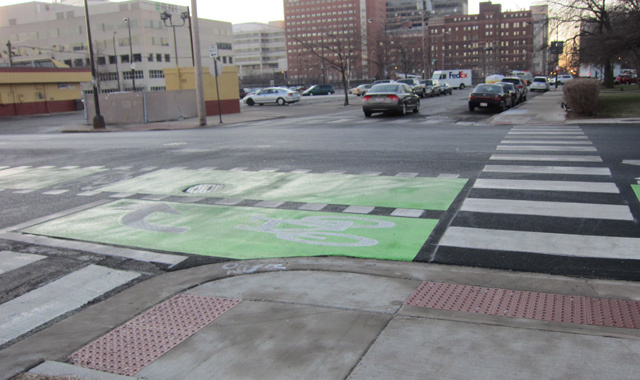 Markings should be white, skid resistant and retro-reflective. 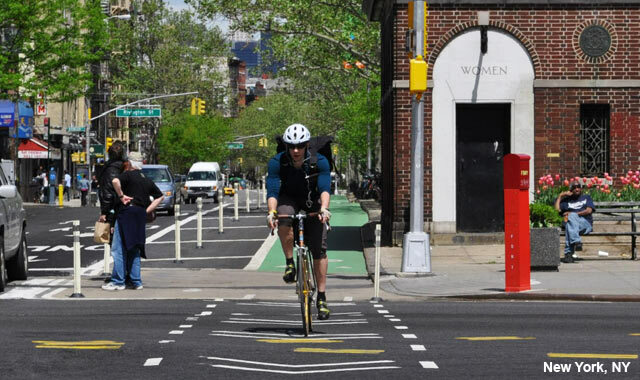 Crossing lane width should match width and positioning of the leading bike lane. 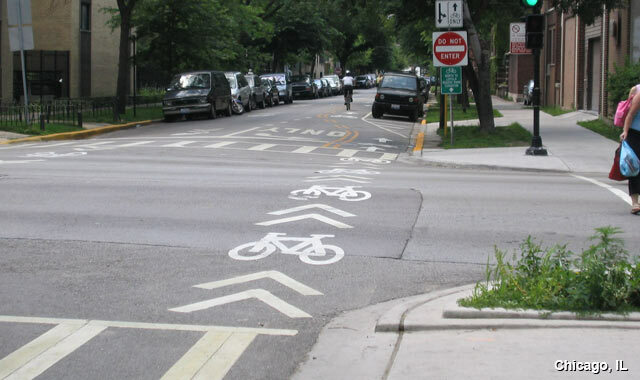 On crossings of two-way paths and cycle tracks, markings should indicate that there is two-way traffic either by marking the path center line through the intersection, or by marking bicycle silhouettes and / or chevrons in opposite directions in the two lanes. See Two-Way Cycle Tracks. Chevrons may be used for increased visibility within conflict areas or across entire intersections. 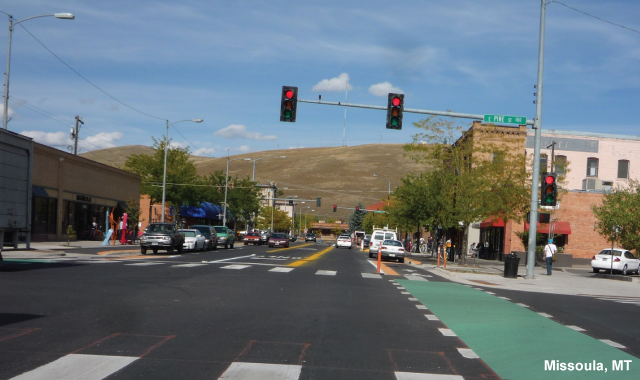 Placement shall be in the middle of the moving lanes, and close to crosswalks. Federal Highway Administration. 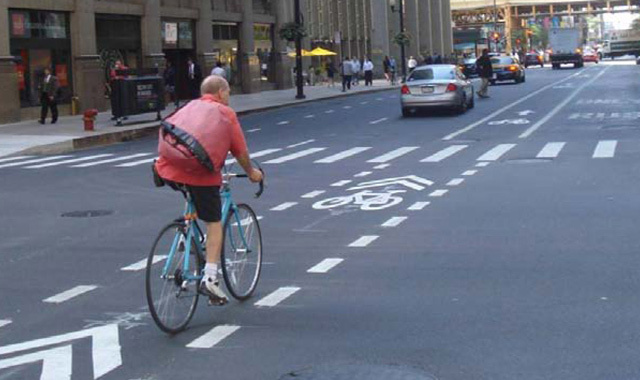 (2011).Bicycle Facilities and the Manual on Uniform Traffic Control Devices. 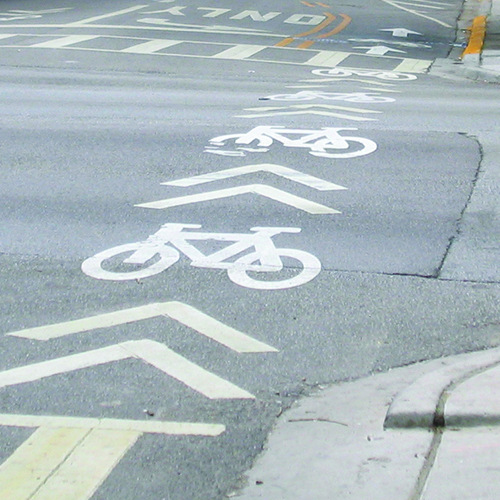 Elephant’s Feet Bicycle Crossing Markings are defined as 200-400 mm wide squares with equal distance spacing. Combinations of several of the above strategies may be considered to increase visibility. Federal Highway Administration. (2009). Manual on Uniform Traffic Control Devices. Section 3B.16. 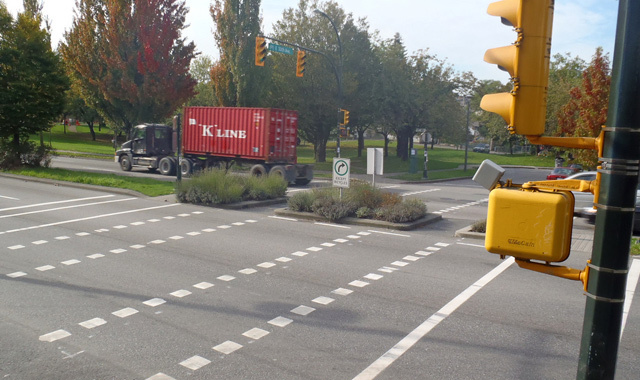 Because the effectiveness of marked crossings depends entirely on their visibility, maintaining marked crossings should be a high priority. Commonly used in dozens of European bicycle friendly cities. 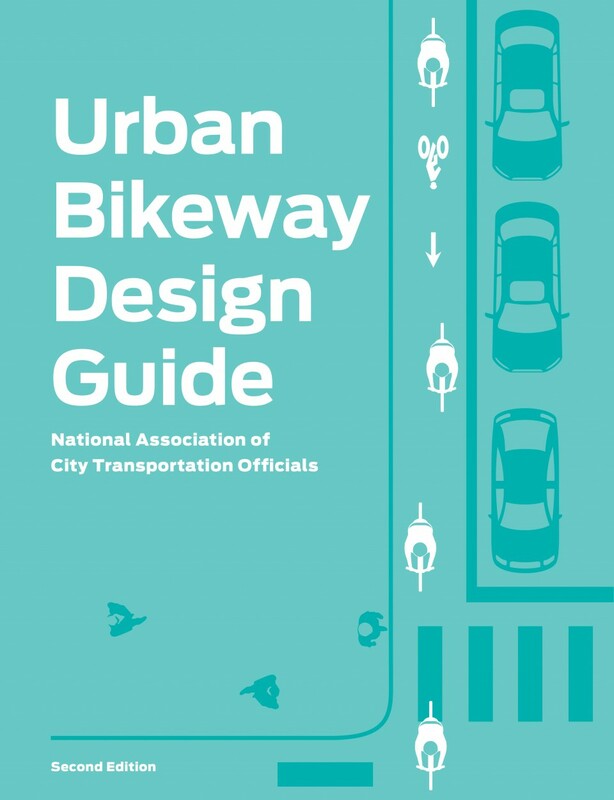 Adapted from the Urban Bikeway Design Guide, published by Island Press. 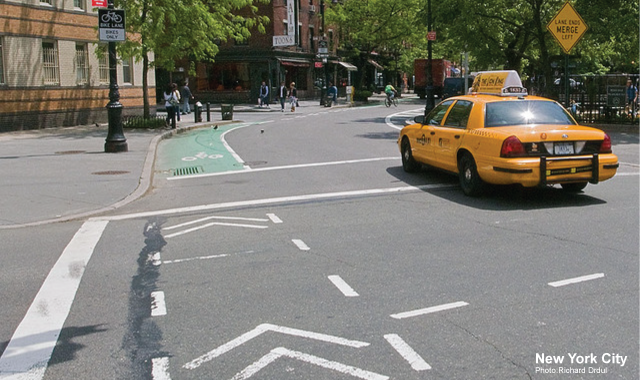 References for Intersection Crossing Markings: 10 found. Parks, Jamie, Paul Ryus, Alison Tanaka, Chris Monsere, Nathan McNeil, Jennifer Dill, & William Schultheiss. 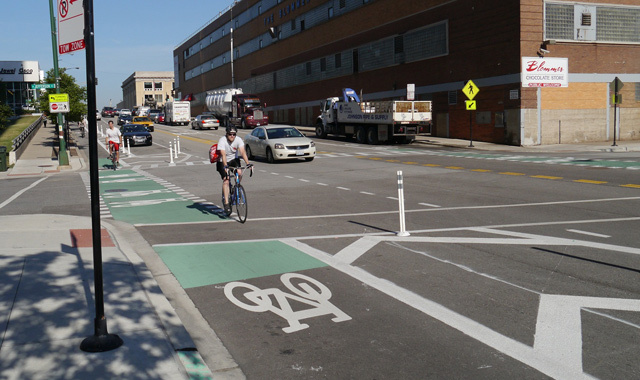 "Bicycle Facility Evaluation: Washington, DC." District Department of Transportation, District of Columbia, Washington, DC. Boulevard Transportation Group. 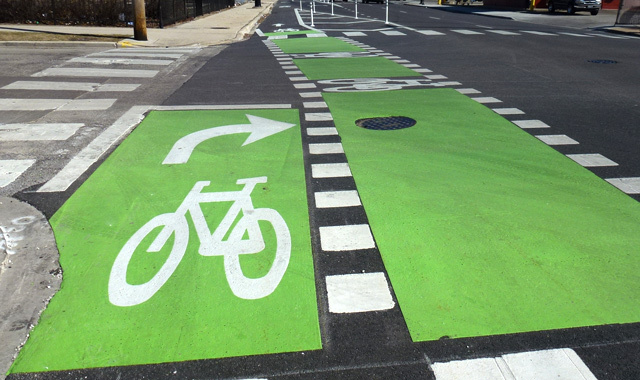 "Coloured Bicycle Lanes Simulator Testing." 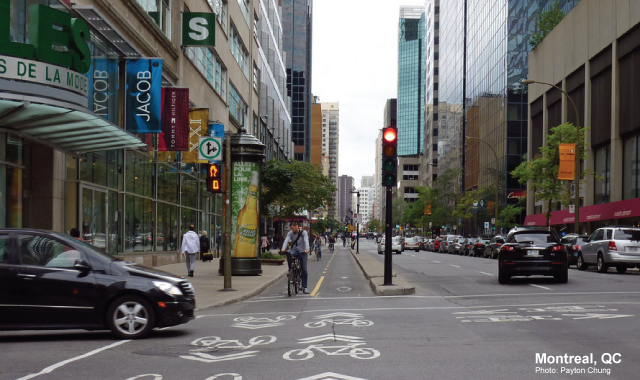 Transportation Association of Canada, Transportation Association of Canada, Ottawa, ON. District Department of Transportation. 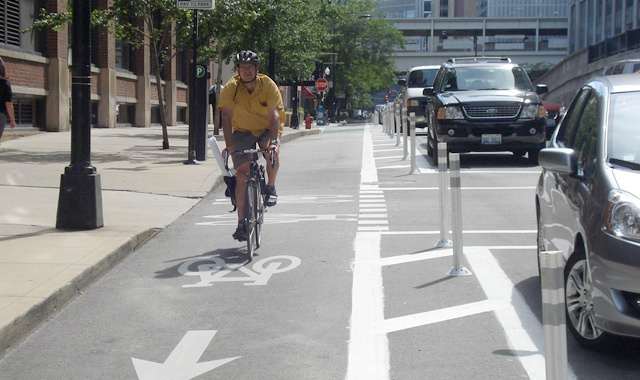 "Bicycle Facility Design Guide." District Department of Transportation, The District of Columbia, Washington, DC. Hunter, William W, David L Harkey, J Richard Stewart, & Mia L Birk. 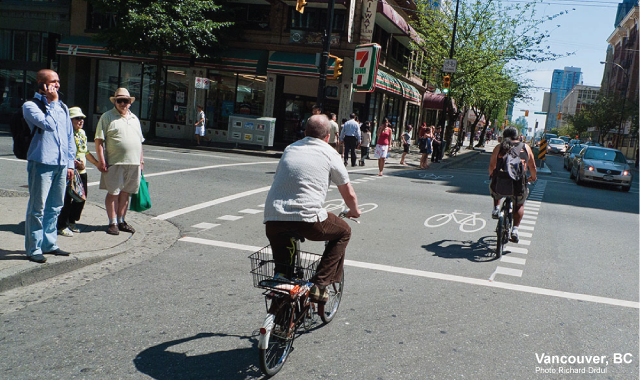 "Evaluation of Blue Bike-Lane Treatment in Portland, Oregon." Transportation Research Record 1705, Transportation Research Board, Washington, DC. Federal Highway Administration. "Manual on Uniform Traffic Control Devices." Federal Highway Administration, U.S. Department of Transportation, Washington, DC. Pucher, John, Jennifer Dill, & Sandy Handy. 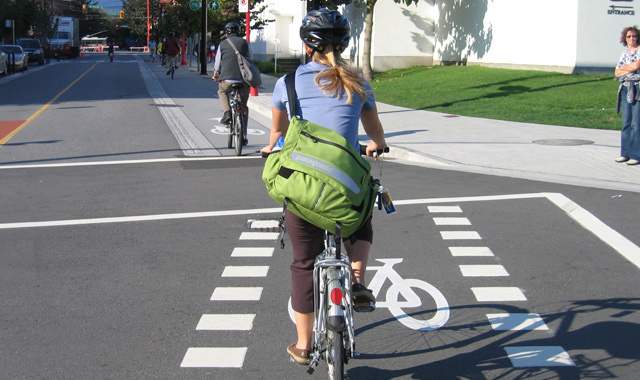 "Infrastructure, Programs, and Policies to Increase Bicycling: An International Review." Preventive Medicine 50: S106-S125, Elsevier Science, New York, NY. Gârder, Per, Lars Leden, & Urho Pulkkinen. 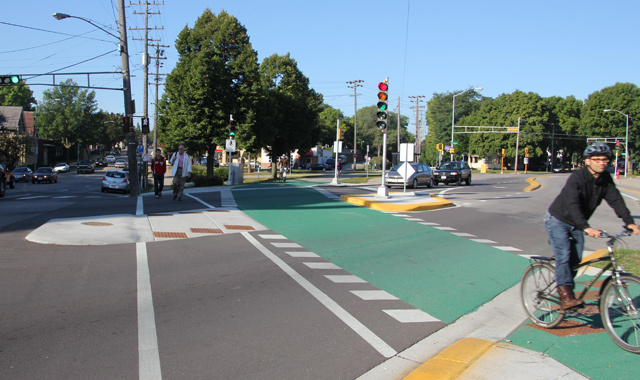 "Measuring the Safety Effect of Raised Bicycle Crossings Using a New Research Methodology." Transportation Research Record 1636, 98-1360, Transportation Research Board, Washington, DC. Portland Bureau of Transportation. 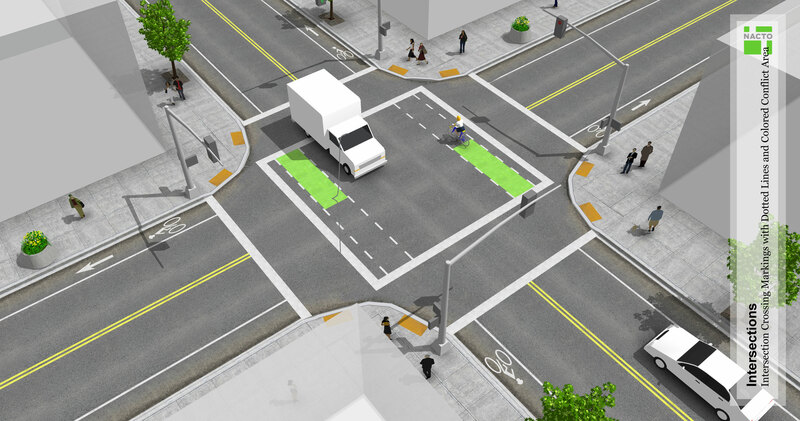 "Portland Bicycle Plan for 2030, Appendix D: Bikeway Facility Design, Survey of Best Practices." Bureau of Transportation, City of Portland, Portland, OR. Birk, Mia, Robert Burchfield, & Jonathon Flecker. 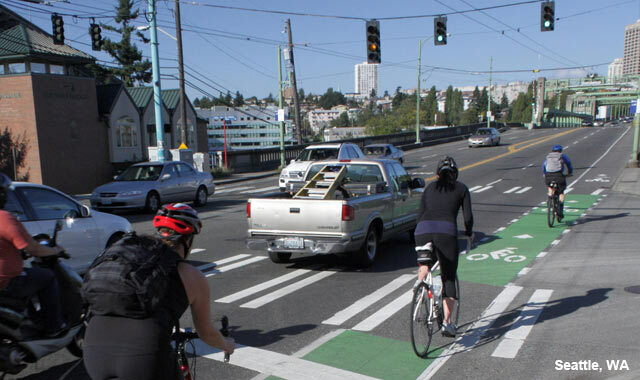 "Portland’s Blue Bike Lanes: Improved Safety Through Enhanced Visibility." 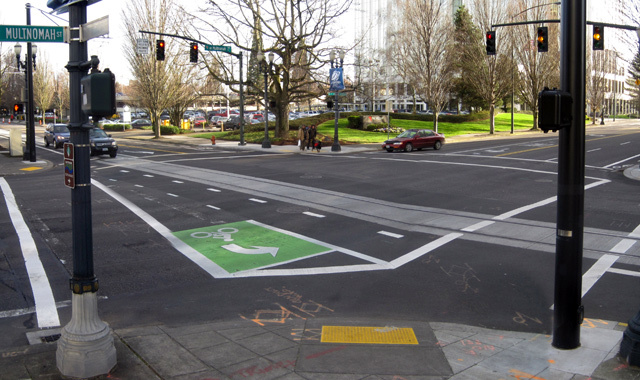 Supported by UNC Highway Safety Research Center, City of Portland Office of Transportation, Portland, OR. Jolicoeur, Marc. 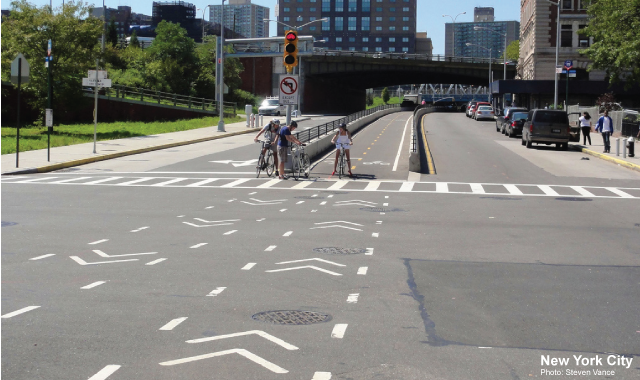 "Technical Handbook of Bikeway Design." Vélo Québec, Montreal, QC.